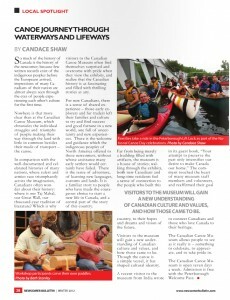 This article first appeared in the Winter 2012 edition ofÂ The Newcomer Bulletin. In comparison with the well-documented and celebrated histories of many nations, where rulers and armies race triumphantly across the imagination, Canadians often feel our history isnâ€™t that exciting – where is our Taj Mahal, our Great Wall, our thousand-year tradition of literature? Faced with such magnificent accomplishments, we sometimes feel that thereâ€™s nothing in our past worth noting. 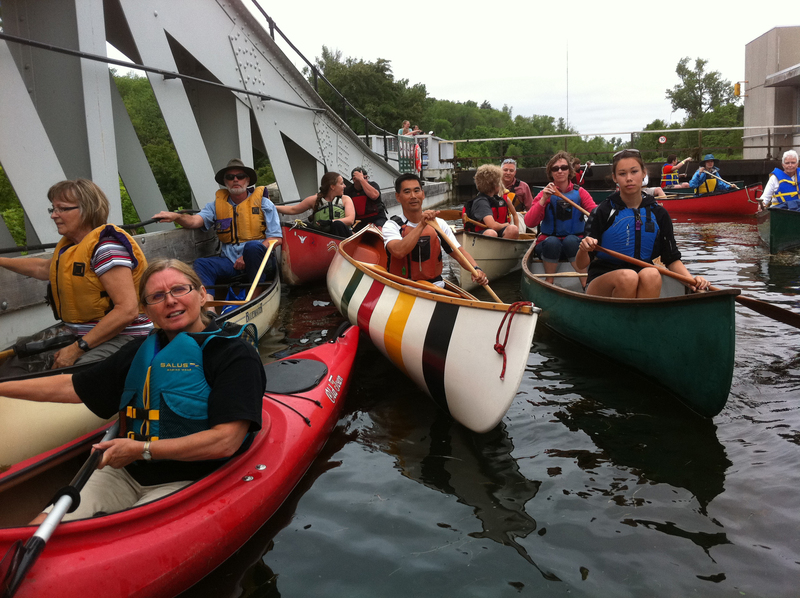 Â Which is why visitors to the Canadian Canoe Museum often find themselves surprised and overcome with pride when they view the exhibits, and realize that our history is as fascinating and filled with thrilling stories as any. For new Canadians, thereâ€™s a sense of shared experience – those early explorers and fur traders left their families and culture to try and find success and good fortune in a new world, one full of uncertainty and new experiences. Â Thereâ€™s the welcome and guidance which the Indigenous peoples of North America offered to these newcomers, without whose assistance many early settlers would certainly have failed. Â Thereâ€™s the sense of adventure, of learning new languages, customs, and lands. Â Itâ€™s a familiar story to people whoâ€™ve made the courageous choice to start a new life here in Canada, and a central part of the story of this country. Far from being merely a building filled with artifacts, the museum is a house of stories; walking through the exhibits, both new Canadians and those who were born here feel a sense of connection to the people who built this country, to their hopes and dreams and vision of the future. You gain a new understanding of Canadian culture and values, and how those came to be. Â Though the canoe is a simple vessel, it has shaped our cultural identity, and you donâ€™t need to paddle – or even to have set foot in a canoe – to find a personal connection to the people whose livelihoods depended upon them. A recent visitor to the museum from India wrote in our guest book â€œYour attempt to preserve the past only intensifies our desire to make Canada our home.â€ This comment touched the heart of many museum Staff members and Volunteers, and reaffirmed our goal to connect Canadians and those who love Canada to their heritage. 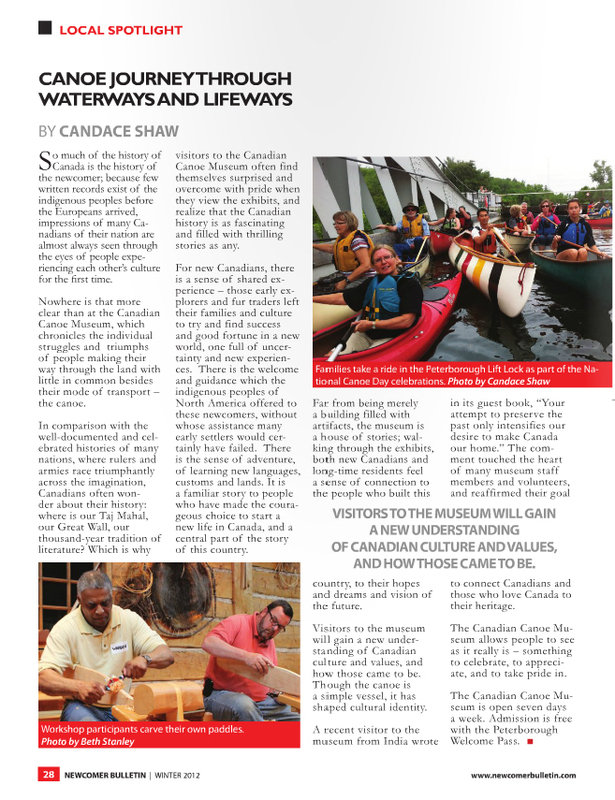 Â While those whoâ€™ve lived in this country many years may have taken our culture and history for granted, the Canadian Canoe Museum allows us all to see as it really is – something to celebrate, to appreciate, and to take pride in. The Canadian Canoe Museum is open 7 days a week, and admission is free when you show your Peterborough Welcome Pass. 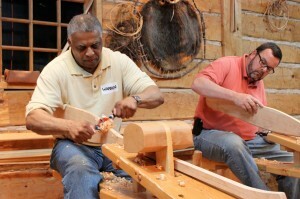 Â Come and connect to our shared heritage, and tell your friends and family about your museum experience! To read the article as it appeared in the Newcomer Bulletin, please click here.